Is this a Sukkah? Read on to discover more. Sukkot began as one of the three major harvest festivals of the ancient Hebrew people. In the spring, farmers harvested winter wheat during Matzot (shepherds called it Pesakh/”Passover”). In the summer, the first fruits of the field were collected and celebrated as Katzir (“harvest” – later called Shavuot/“weeks”). And in the fall, the major wheat harvest was marked by the building of booths (sukkot) in the fields, working by day and eating and sleeping by night. The seven day long Sukkot holiday comes shortly before the rainy season in the land of Israel, and the Sukkot was THE major fall festival before the addition of the “High Holidays” of Rosh Hashanah and Yom Kippur. See, for example, the calendars in Exodus 34 or Deuteronomy 16, which mention only those three harvest holidays. So the people went out, and brought them, and made themselves sukkot, everyone on the roof of his house, in their courts, in the courts of God’s house, in the wide place of the water gate, and in the wide place of Ephraim’s gate. All the assembly of those who had come back out of the captivity made sukkot, and lived in the booths; for since the days of Joshua the son of Nun to that day the children of Israel had not done so. There was very great gladness. “Since the days of Joshua” means over 700 years earlier! Which is more likely, that a new ritual was claiming to be old, or that a major holiday had been in the holiest Hebrew book for 700 years and no one had observed it all that time? In the biblical calendar, Sukkot and autumn were in the seventh month, though in Judaism today Sukkot begins on the 15th of the first month. At the Jerusalem Temple, a major pilgrimage would culminate in a special water pouring ritual on Sukkot, but these were discontinued after the Temple’s destruction 2000 years ago. Over the centuries, as the Jewish people became more urban and for most farming became a cultural memory, symbolic aspects of Sukkot took on more importance. Building a Sukkah: even if not used for harvesting, a temporary structure of at least 3 walls with a partially covered roof is traditionally built soon after Yom Kippur. Some Jewish congregations build a common sukkah, while other individual families may have their own. Some even eat or sleep in their sukkah. 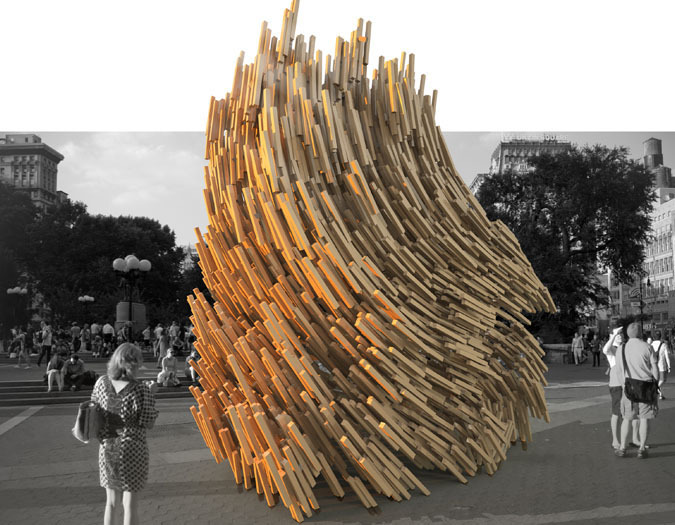 The creative design contest “Sukkah City 2010″ has a nice summary of traditional rules for sukkah construction. Lulav: a combination of branches from willow, myrtle, and date palm trees. When shaken, sounds a bit like the rain hoped for by the ancient farmers. 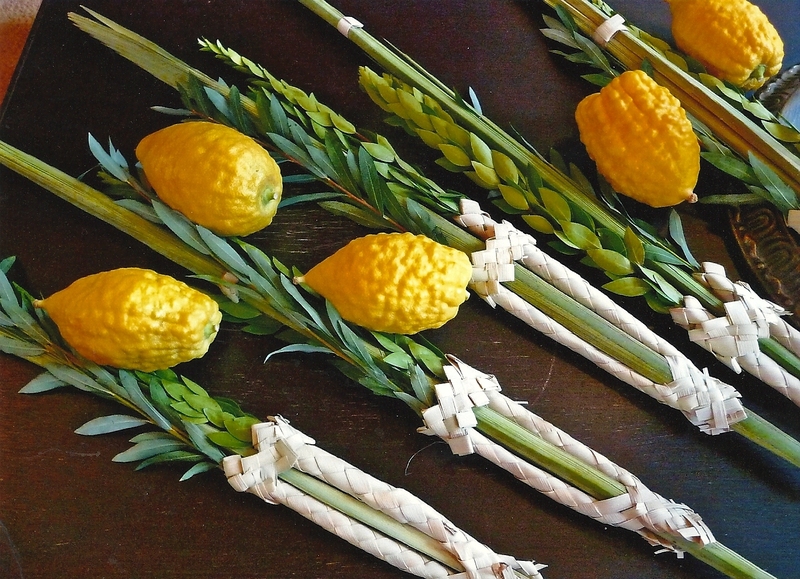 Etrog: a yellow citron, it is not edible but has a sweet perfumed scent. Once, when a Jerusalem Temple priest disrespected the water ritual, the people pelted him with their etrogim! Guests: it is an old tradition to welcome guests (ushpizin) into one’s sukkah. Some imagine famous Biblical figures as participants in their celebration. Whom would you invite? Bible: Exodus 34, Leviticus 23, Deuteronomy 16, Nehemiah 8.